Then. 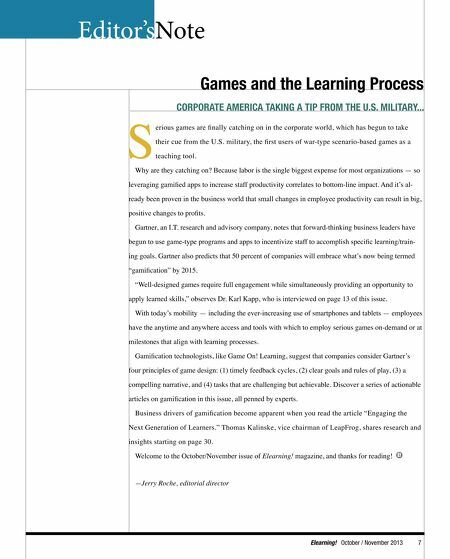 OCTOBER / NOVEMBER 2013 VOLUME 9 NUMBER 6 Catherine Upton Group Publisher >> cupton@2elearning.com Jerry Roche Editorial Director >> editor@2elearning.com Joe DiDonato Editor at Large >> jdidonato@2elearning.com Sarah Chapman Engagement Manager >> schapman@2elearning.com Now. JW Upton Vice President >> JW@2elearning.com David George Sales Executive >> davidg@2elearning.com Mary Quigg Event Operations Manager >> events@2elearning.com Kim Lewis Art Director >> production@2elearning.com Contributors: Dr. Rob Foshay, The Foshay Group Linda K. Galloway, insidHR Communications Kathy Heldman, Game On! 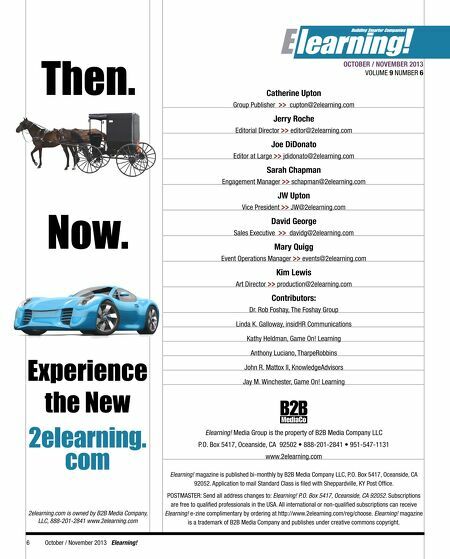 Learning Experience the New 2elearning. com Anthony Luciano, TharpeRobbins John R. Mattox II, KnowledgeAdvisors Jay M. Winchester, Game On! Learning Elearning! Media Group is the property of B2B Media Company LLC P.O. Box 5417, Oceanside, CA 92502 • 888-201-2841 • 951-547-1131 www.2elearning.com Elearning! magazine is published bi-monthly by B2B Media Company LLC, P.O. Box 5417, Oceanside, CA 92052. Application to mail Standard Class is fled with Sheppardville, KY Post Offce. 2elearning.com is owned by B2B Media Company, LLC, 888-201-2841 www.2elearning.com 6 October / November 2013 Elearning! POSTMASTER: Send all address changes to: Elearning! P.O. Box 5417, Oceanside, CA 92052. Subscriptions are free to qualifed professionals in the USA. All international or non-qualifed subscriptions can receive Elearning! e-zine complimentary by ordering at http://www.2elearning.com/reg/choose. Elearning! magazine is a trademark of B2B Media Company and publishes under creative commons copyright.